Sir John personally served King Henry VIII during the “King’s Great Matter,” during which Henry petitioned Pope Clement VII to annul his marriage to Catherine of Aragon. Catherine had not produced an heir to his throne, and Henry asked the Pope to give him leave to marry Ann Boleyn, his mistress and a lady in Catherine’s entourage. The Pope refused, and Henry severed the Church of England from the Roman Catholic Church in 1533. Whatever Sir John’s role was in this event, it pleased the King and John became a rich man for his efforts. He turned his attention to building a suitable home for a man of his means and station. Sometime before 1509, John had moved to Kelvedon Hatch with his father. The Doomsday Book, a census ordered by King William I in 1086, mentions Kelvenduna, a feudal estate lorded over by a Saxon soldier/sailor, Aethelric. It’s thought that Aethelric may have built St. Nicholas, the oldest surviving church in the area. In 1066, Aethelric had sailed off to fight William the Conqueror, the Wryta brothers, and other Norman invaders. The defeated Aethelric returned to Kelvenduna and continued as lord of the manor under William I. Not long afterwards, however, he fell ill and died. His property passed to the church, probably confiscated by King William, as William did with many Saxon freeholders who fought against him. The ownership of the Kelvenduna estate passed to “St Peter” – the Norman arm of the Roman Catholic Church headquartered in Westminster Abbey. Specifically, it passed to Odo, the Bishop of Bayeux and William’s half-brother. This was William’s way of keeping the spoils of war in the family. John erected Kelvedon Hall next to the old Saxon church allegedly built by Aethelric. Its construction took 14 years, beginning in 1524. 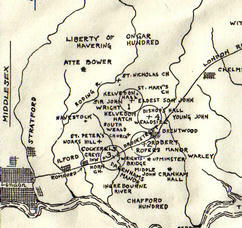 In 1538, he bought the surrounding lands – about 2000 acres – from Richard Bolles and Westminster Abbey for ₤493. 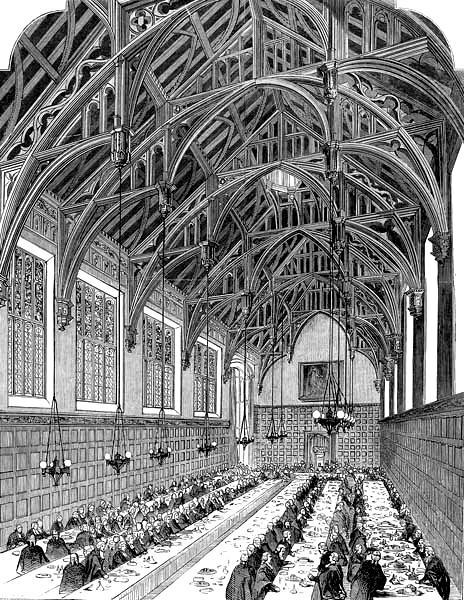 Bolles had inherited the tenancy of the lands from his mother’s family, the Multons, who had in turn been granted the tenancy in 1225 from Westminster Abbey. This real estate deal reeked of politics. The transfer of lands from the church to the loyal gentry was part of Henry’s campaign to weaken the power of the Roman Catholic Church in England. Sir John Wright II died in Kelvedon Hall on 5 October 1551. His wife Lady Olive Hubbard Wright died in Kelvedon Hatch on 22 June 1560. 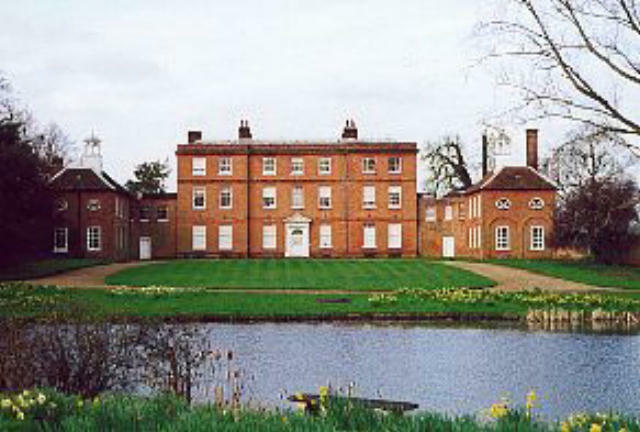 Middle John Wright was born in Kelvedon Hall in 1522. According to his father’s will, executed in 1551, “To my son called Myddle John I give all the land I have in Havering and houses and millers house and a tenement in Childerditch wherein Gibbes doth dwell.” This was the area where the bridge that the Wrights had tended for centuries spanned the Ingrebourne River. 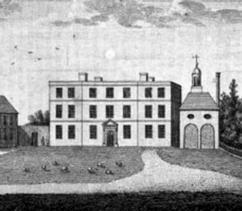 The land was known as Wrightsbridge, and the manor house and estate was referred to both as Wrightsbridge Manor and Dagenham Manor. During his time, Englishmen identified each other less and less as Norman and Saxon and became much more concerned with who was Catholic and who was Protestant (Anglican). Middle John and his siblings were mostly Protestant, their father having supported Henry VIII’s break with Rome. 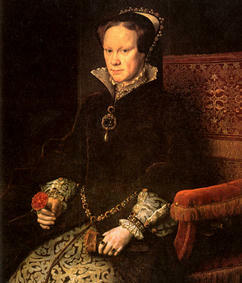 But in 1553, just before Middle John’s death, Henry VIII’s daughter Mary I (1553-1558) came to the throne and pressed for England to return to Catholicism. She was ruthless in this endeavor, had over 280 Protestant dissenters burned at the stake, and earned the sobriquet “Bloody Mary.” Fortunately for the Wrights and other Protestants, her reign was short and the persecution ended when her Protestant sister Elizabeth I (1558-1603) came to the throne. But it was a harbinger of things to come; the tensions between religious sects in England continued to grow. Middle John married Alice Rucke of Kelvedon Hatch in 1541. They had six children, Dorothy, John, Mary, Olive, Agnes, and Robert. Middle John died in Wrightsbridge in 1558 when he was just 36 years old. His wife Alice did not live much longer; she died in 1560. Middle John’s first son, John Wright, was born in 1548 and inherited the Wrightsbridge lands and Dagenham Manor when he was just 10 years old. He was granted peerage by Queen Elizabeth I (1558-1603) in 1590 and given a seat in the House of Lords. He was married twice, the first time to Elizabeth Linsell about 1568. She bore him three sons and two daughters – John, Samuel, Jane, Nathaniel, and Elizabeth. His first wife died in 1589 and John married Bennett Greene in 1590.He had three more children with her – Lawrence, Bennett, and William. They lived in auspicious times, Elizabethan England was a foment of new ideas and opportunities. Francis Bacon codified the Scientific Method, William Harvey mapped the circulatory system, and Sir Francis Drake sailed around the world. In 1587, the English took an interest in colonizing America and finally succeeded in 1607. The King James Bible was published in 1611, making this book available in English for the first time. England’s agrarian economy expanded to include large-scale manufacturing and global trade. Young men left the rural manors and filled the cities, becoming doctors, lawyers, and merchants. From these new urban professionals emerged a literate middle class who devoured the plays of Shakespeare and the books of Milton and loudly debated the finer points of politics, philosophy, and religion. Among these new ideas was Puritanism. Henry VIII’s break with the Pope had been welcome in England not because the English wanted their King to have his marriage annulled, but because of the excesses and the failures of the Catholic Church. 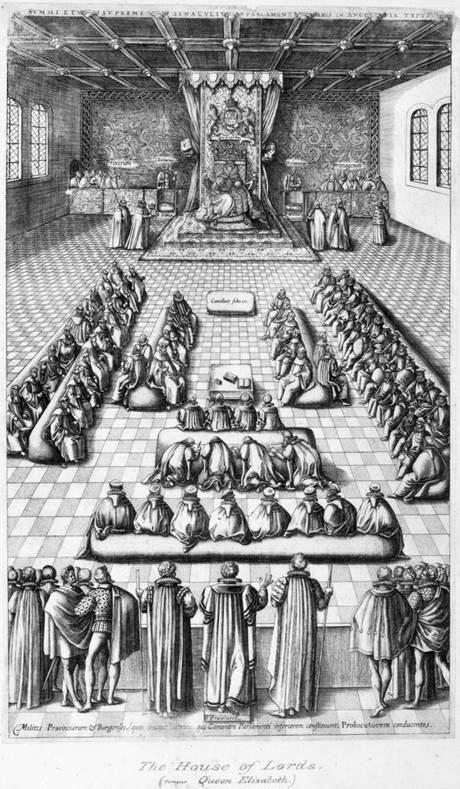 The Church of England was the beginning of the Reformation in England, but many felt it did not reform enough. 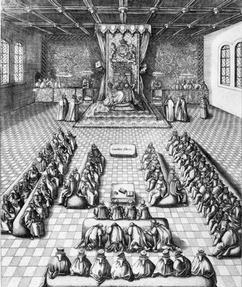 The Anglican church retained much of the pomp and ceremony of the Catholic church it had replaced. More important, the rigid clerical hierarchy remained – the King and had simply replaced the Pope. Moreover, English protestants who fled to other countries during the reign of Mary I brought back to England the ideas of John Calvin and other contemporary theologians. This stew of religious ideas gave rise to the Puritans, who emerged largely from the new English middle class. As a group, they proposed less pomp and more substance. They rejected the hierarchy and the notion of a supreme spiritual leader to whom they owed allegiance. They wanted their congregations to have more autonomy and their God to be more accessible. At least two of Lord Wright’s sons, John and Nathaniel, had strong Puritan leanings. Lord John Wright died at Wrightsbridge in 1624 as the Puritan movement reached its strongest ebb – and a year before they faced their greatest challenge. John Wright was born in 1569 at Wrightsbridge, Essex County, England. Although firstborn, there is no record that he inherited the Wrightsbridge lands or Dagenham manor. Instead, he seems to have had a successful career in London. He graduated from Emmanuel College at Cambridge University (a hotbed of Puritan radicals) in 1593 and was admitted as a barrister to Gray’s Inn (an influential legal association) in 1598, and began a clerkship in the Courts that same year. He married Martha Castell in 1594, and they had four sons – John, Nathaniel, Samuel, and Robert. Martha died in 1610 and John remarried to Fortune (Garraway) Blount, the widow of Sir Edward Blount, in 1618. John and Fortune had one child, James. In 1612 John Wright, Esq. was appointed a clerk to the House of Commons. Because of this appointment – and because he was a Puritan-leaning Protestant – he was probably at odds with his Anglican father in the House of Lords from time to time. It was a frustrating time for any member of the government; King James I (1603-1625) steadfastly refused to share any real power with Parliament. A Parliamentary document protesting the actions of King James I bears John Wright's signature on it in his capacity as clerk of the House of Commons. This display of opposition to the King by a family member would no doubt have embarrassed a Peer of the House of Lords. We don’t know how well John got along with his father, but if they had religious and political differences this may explain why John did not inherit his father’s land, at least in part. Goings on outside Parliament may have also strained the relationship between father and son. While Puritans weren’t put to death for their beliefs, they weren’t well-tolerated by Anglicans. They were blocked again and again from making reforms to the Church of England and some Anglican bishops openly oppressed Puritan-leaning ministers and congregations. Anti-Puritan sentiment within the government and the Church of England was controlled under King James I (1603-1625), but it was unleashed when his son Charles I (1625-1649) took the throne. He permanently dissolved the Parliament in 1629 and what had been an extremely difficult situation for Puritans in England became hopeless. Puritans began to emigrate to less hostile lands. In 1630, Puritans obtained a royal charter to form the Massachusetts Bay Colony. John’s brother Nathaniel was a charter member and 1/8 owner of the Arabella, flagship of the fleet that carried Puritans to the New World. John’s son Samuel was among those who sailed. John Wright, Esq. remained and died in Dagenham in 1640, only a few years after Samuel left for America. 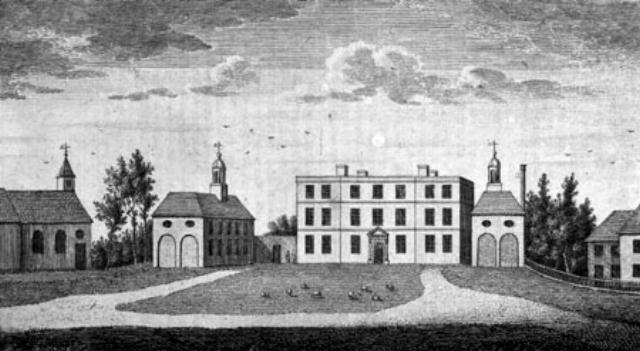 A print of Kelvedon Hall in 1777 showing St. Nicholas Church nearby. The church was abandoned in 1895 although its ruins still stand on the property. The Wright Coat of Arms, granted at the beginning of the reign of Henry VIII. 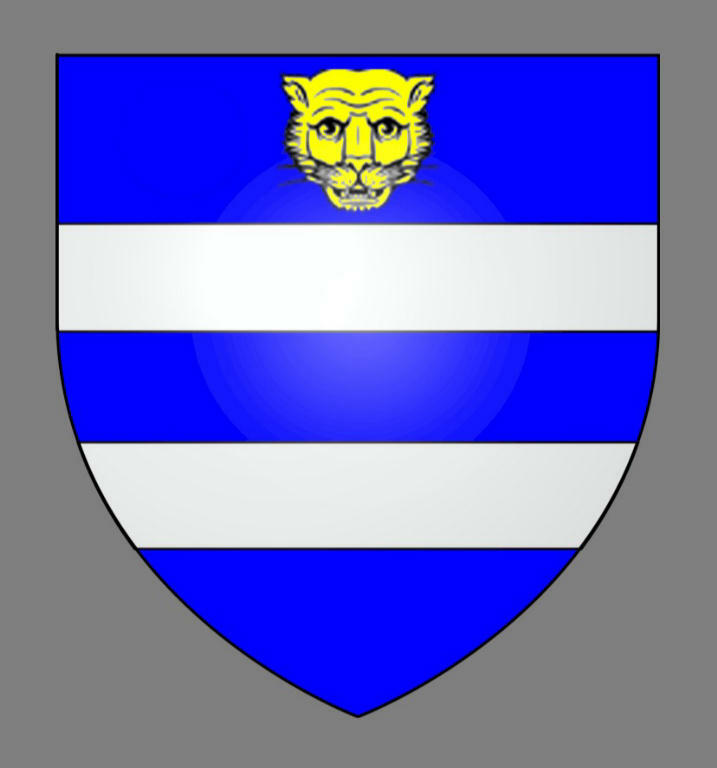 Heraldic leopards were actually lions – "lion passant guardant" – with their heads turned toward the observer. Kelvedon Hall today. 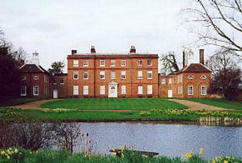 The manor was purchased by American-born author and statesman Henry Channon in 1938 and is still in the Channon family. To visit the hall on Google Earth, click HERE. Photo courtesy History House. This map shows the locations of the four estates owned by Sir John Wright. 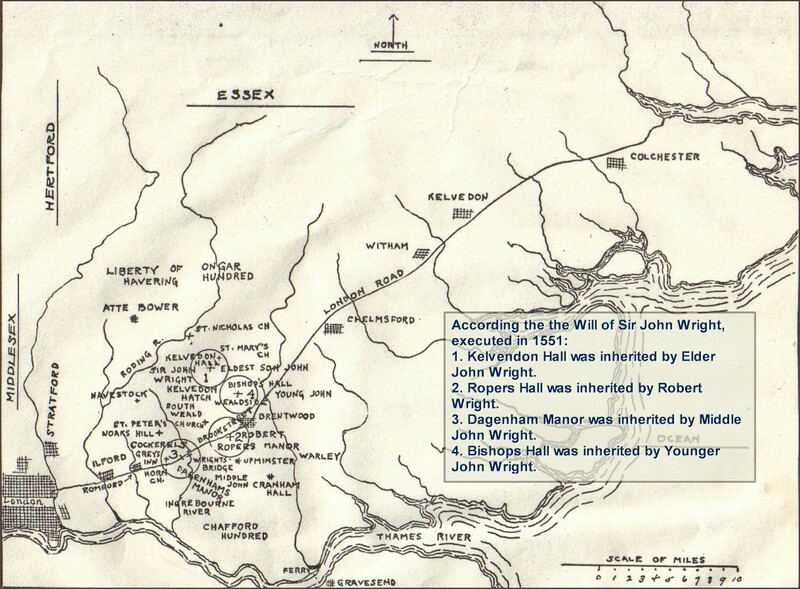 Each of his sons inherited an estate in 1551 – Middle John got Dagenham Manor. 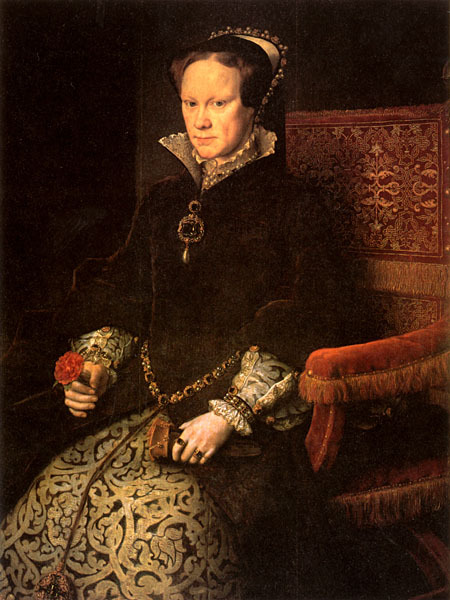 Queen Mary I – "Bloody Mary." Queen Elizabeth presides over the House of Lords, Lord John Wright somewhere amongst them. Peerage was not a taxing responsibility. During the 45 years that Elizabeth ruled, Parliament was in session for about 3 years all totaled. A map of the route that Sir Francis Drake took around the world with a profile of his flagship, the "Golden Hind." Drake's voyage was financed by Elizabeth I. During the voyage, he captured a Spanish treasure ship and the captured gold made Elizabeth a 4700% profit on her investment. 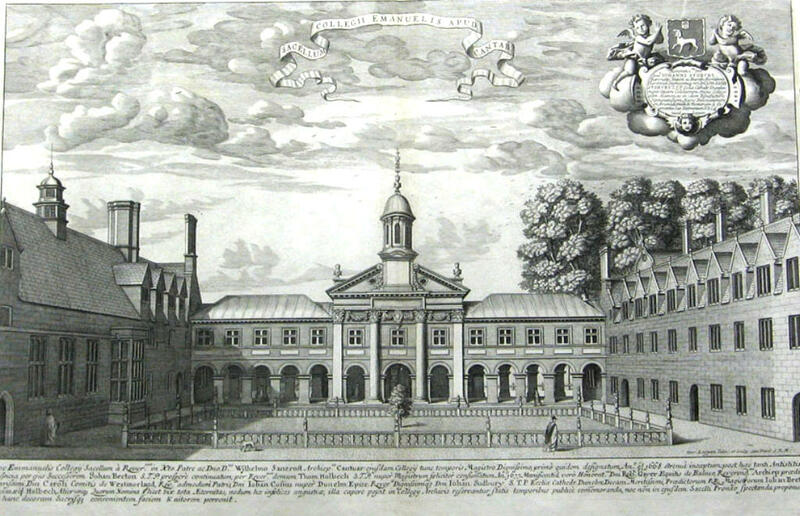 In John Wright's day, Emmanuel College was a new school in an old building – it had been a monastery until Henry VIII confiscated the building and grounds from the Dominican Friars. 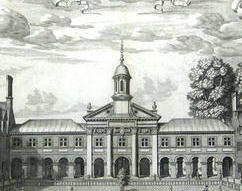 It was purchased in 1584 to house the college. John was a member of the second graduating class. 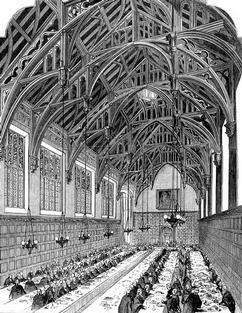 The Great Hall at Gray's Inn. Shakespeare performed here while John was a member. The Dayton and Montgomery County Library -- If you'd like to know more about the Wright family, or research other branches of the family tree, you will find extensive genealogical data here. 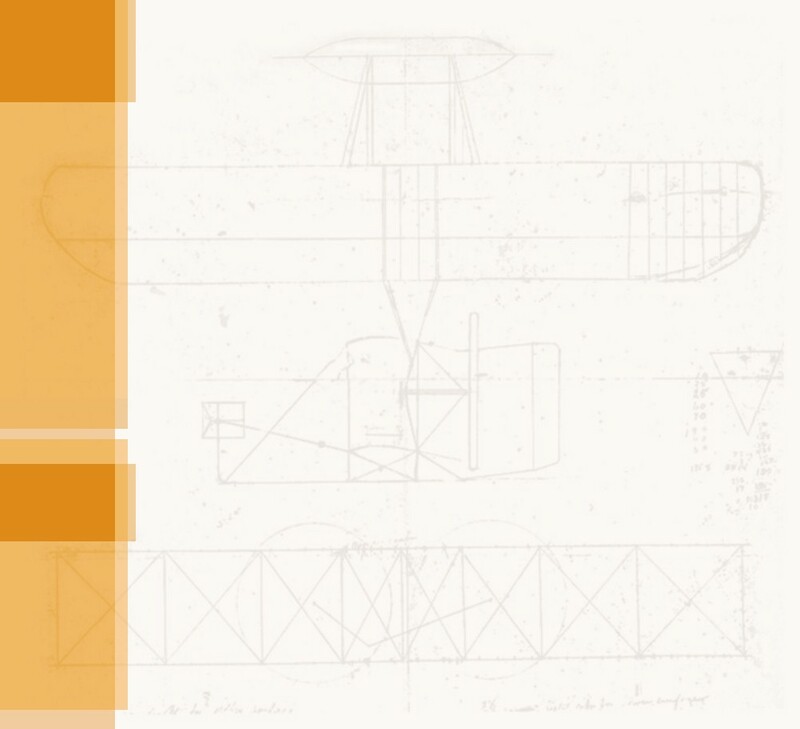 Ohio, Home of the Wright Brothers is a genealogical chronicle of the Wrights and four other families, all ancestors of the Wright brothers. It traces these families as they settle Ohio and Indiana. painting Wilbur and Orville as the sons of pioneers and revolutionaries who built an energetic, forward-looking civilization founded on technology and democracy. 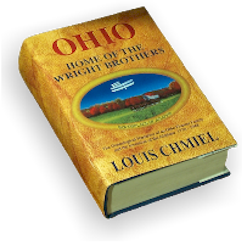 Ohio, Home of the Wright Brothers is the history of the Wright family in America, particularly their settlement of Ohio. Click the cover to read sample chapters.